Eclipse DX has Jet-Air Threading, Fabric Support System, differential feed, needle threader, carry handle. 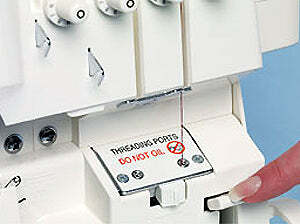 Baby Lock BLE1DX-2 Eclipse DX 4/3/2-Thread 2-Needle Serger. Baby Lock Eclipse DX Key Features. 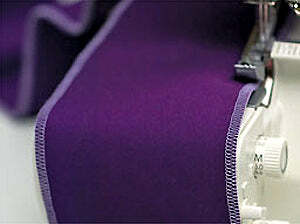 Dial Adjustable Stitch Length And Automatic Rolled Hem. Baby Lock Eclipse DX Specifications. Micromatic Twin Cam Tension System. 2 to 1 Ratio - gathering. 3 to 4 Ratio - stretching. Snap on, multi-purpose presser foot. 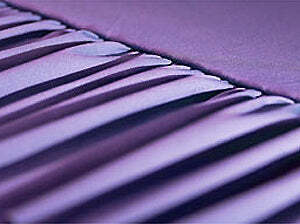 Rolled hemming with 3 or 2 threads. 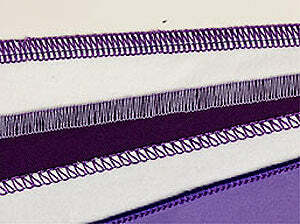 Flatlock stitching with 2 or 3 threads. 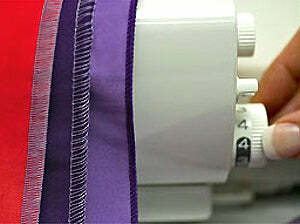 Dial adjustable stitch width: 1.5 - 7.5mm. Dial adjustable stitch length: 0.75 - 4mm. Dial adjustable built-in rolled hem. Adjust presser foot pressure for any thickness of fabric. Warranty (25 yrs. Limited, 10 yrs. Parts, 5 yrs. Electrical, 1 yr. Labor). Baby Lock Eclipse DX Information.